Prague has a longstanding reputation as one of the cultural hubs of Europe, and for good reason. It’s hard not to be inspired by walks down romantic cobblestone streets lined with baroque buildings. Mosaic house is not your typical hostel. The rooms are spacious and feel more like a hotel, without losing the sense of friendliness and community of a hostel. Most sites can be easily accessed by foot or public transportation from Mosaic House. We love a good design hotel and Boho Prague’s minimalist design, luxurious rooms, and central location make it great home base in Prague. The hotel is just a five minute walk from old town and reasonably priced. Prague is a beautiful and walkable city. There is a ton to see and many of the popular attractions are well worth the hype. Possibly the most popular attraction in Prague, Old Town Square is worth a visit. You can reach Old Town Square by walking straight from the Charles Bridge. The square itself is beautiful. Enjoy some Trdelnik and see the Astronomical clock. It’s worth taking the time to climb to the top of the clock. The entry fee is reasonable and the view breathtaking. The Lennon Wall is one of the most iconic spots in Prague. It’s amazing to see some of the talented street art on the wall. The wall started as a place for students to rebel against the communist regime by putting up Beatles lyrics & graffiti. Today, the wall continues to change as new artists, students, and visitors contribute. Bring a sharpie so that you too can leave your mark! Located uphill from the Prague Castle, the Strahov Monastery offers amazing view of the city and a calm oasis from Prague’s hustle and bustle. Despite being ransacked by invading forces over the years, the library still contains an impressive 16,000 + books. Make sure you stop by the Monastery Brewery and order a beer. If you haven’t gotten your fill of green space, visit Letna Hill. The park is beautiful and there are great views of old town. In our opinion, this is one of the most beautiful places in Prague. Best of all, it's free! The gardens themselves are lovely and are of baroque design. Keep your eyes out for the Peacocks that inhabit the gardens. Touring the Jewish quarter is well worth it to understand the history of Prague. In World War II, Hitler had planned to preserve the quarter as a museum of an extinct race. While there, be sure to visit the Old Jewish Cemetery and Pinkas Synagog. It can be easy to work up an appetite wandering around a new city. Cukrkavalimonada is a lovely little cafe near the Lennon wall and the perfect place to stop for a lunch break. Be sure to try their delicious sandwiches and hot chocolate. Located within walking distance from Mosaic House, Restaurance Ostrovni is a great place to enjoy an inexpensive hearty Czech meal. We loved the sauces used in all the dishes we tried. The beer is also fantastic. If you’re looking to splurge on a nice meal, Kampa Park has amazing french food and breathtaking views of the river. Make sure you request a table with a view when booking! You’ll notice that are a number of stands throughout Prague selling Trdelnik, a fried dough, and Smažený Sýr, a fried cheese. Both are delicious and worth trying. If you’re a fan of clubbing, pass on Karlovy Lazne (five story club), and venture to SaSaZu instead. SaSaZu is a huge club with a great mix of music and is less touristy than Karlovy Lazne. Double Trouble is a cross between a bar and a club. There is a dance floor as well as a chiller bar area. It’s a great spot to go with friends, especially if you are trying to appease different going out preferences. The public transit in Prague is inexpensive and efficient to use. The city is also incredibly walkable. We walked almost everywhere when we were in Prague. To get to and from the airport you can take a bus (119) to Dejvicka and the green line into the city. Cabs from the airport are also inexpensive if you are traveling with a group of friends. If you are coming back from a night out or looking to use a cab, we recommend using Uber or an AAA cab, as the cabs in Prague are known to rip off foreigners. 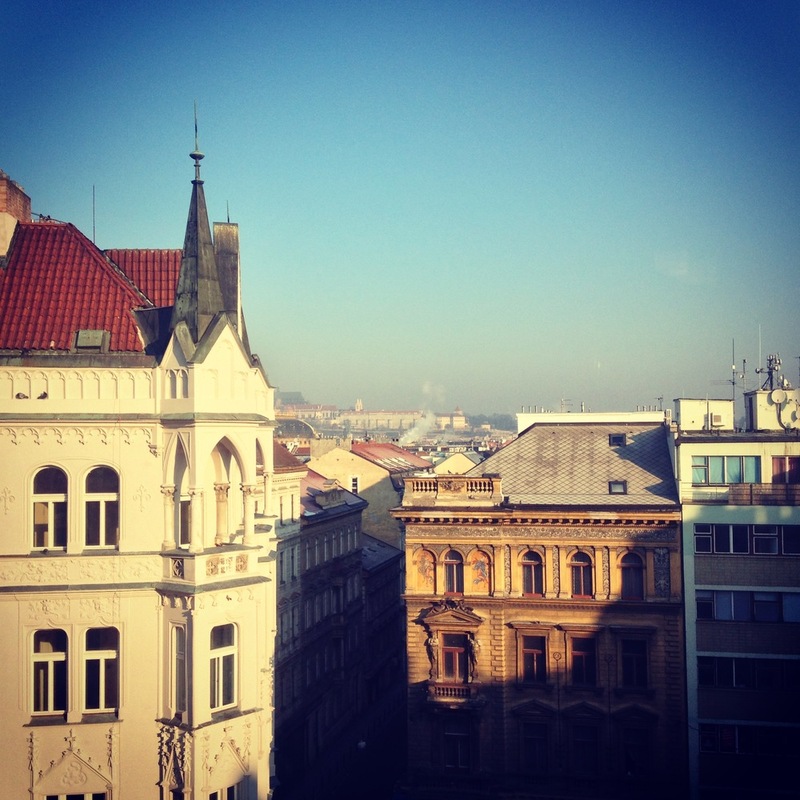 What do you love about Prague?